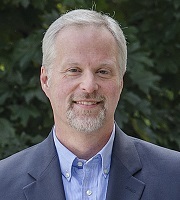 Professor of Legal Research and Writing Scott Anderson brings 15 years of extensive legal experience to the law school. For the past six years, he has been staff attorney at the Ohio Criminal Sentencing Commission and before that served as the Commission’s juvenile coordinator. His experience also includes prosecuting adult felony crimes for the Licking County Prosecutor’s Office before being promoted to managing attorney of the juvenile and civil divisions. Anderson also brings extensive teaching experience; he was a part-time instructor teaching contemporary ethical theory and the philosophy of law at The Ohio State University and has been a seminar instructor on a variety of legal issues for state agencies and the Ohio Judicial College. Anderson has been a member of the American Philosophical Association, the Committee on Juvenile Rights in the Justice System, and the Ohio Supreme Court Workgroup on Juvenile Defendant Access to Legal Counsel. He holds a Ph.D. in Philosophy from The Ohio State University and a J.D. from Case Western Reserve University.